We’ll jump in straight away and say there are no updates this week so please continue testing with the cards, rules and scenarios from last week. We want to make sure we gather all of the information we can before moving forward as we close in on the final stages of development for the Kickstarter content. Some of you may be aware that across the 12-14th October we hosted Steamcon US in Nashville, thanks to those of you that made it there and we hope you had an amazing time! Part of any Steamcon is the keynote, where we highlight new and exciting things and occasionally let out a spoiler or two! So, what was shown off during the keynote as far as Godtear is concerned? Firstly, there is the gorgeous texture work that has gone into the Kickstarter exclusive neoprene mat! Secondly, some tremendous graphic work that has gone into the token sheets. 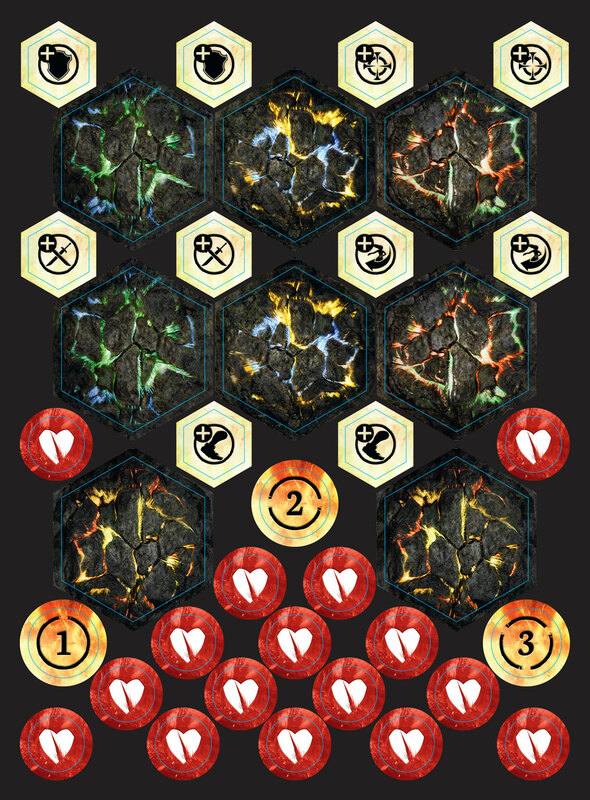 Not to brag, but they’re probably the most beautiful wound tokens we’ve ever seen! Finally, a very vague spoiler of what is yet to come in the world of Godtear. What do you think this could be? The more speculation the better! So, there you have it folks all the shiny goodness from Steamcon US regarding Godtear! We’ll be back with a gameplay update next week so please keep the feedback rolling in and thanks for all of your continued support! What final changes would you recommend before all Kickstarter content is locked and heads to the printer?